When I was young my family and I went on a guided tour of Dunster Castle. I was – as was often the case back then – bored, and – as I still am to this day – in my own little world. I must have started fiddling with one of the displays because the snobby tour guide broke from her monologue to sternly tell me not to touch it. The whole of the tour group turned to look at the grubby little oik with his mouth open who had dared to touch the expensive-looking stuff and my parents tried to bury themselves in the William Morris carpet. Okay, I was young and I would probably find it all rather interesting now, but really… does everything in the name of art have to be kept behind soft, red rope? Do we have to be kept behind bars like we’re animals in a zoo? It seems very condescending of museums to keep these displays of wealth at arms length from us hoi polloi. In my perpetually irreverent mind they are saying: look, this is valuable, this is special, and you… you are most certainly not! Stanmer Park, East Sussex, is one of my favourite places to walk. I know it’s many woodland paths so well I can wander around without even thinking where I’m going. Whichever way I go, I inevitably walk past the badger sculpture there. 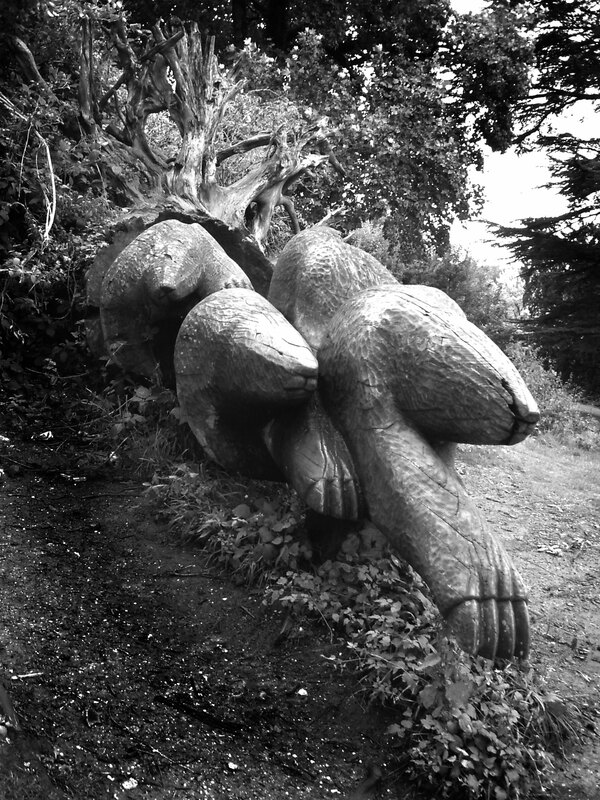 Sculptor Reece Ingram carved the image of four badgers running from a set out of a 163-year old fallen Cedar of Lebanon. The sculpture is big and chunky and smooth and lovely. I always feel compelled to hold one of the badger’s giant paws and feel its sharply chiseled claws. Kids love it: they clamber over it and ride the badgers like a herd of horses. 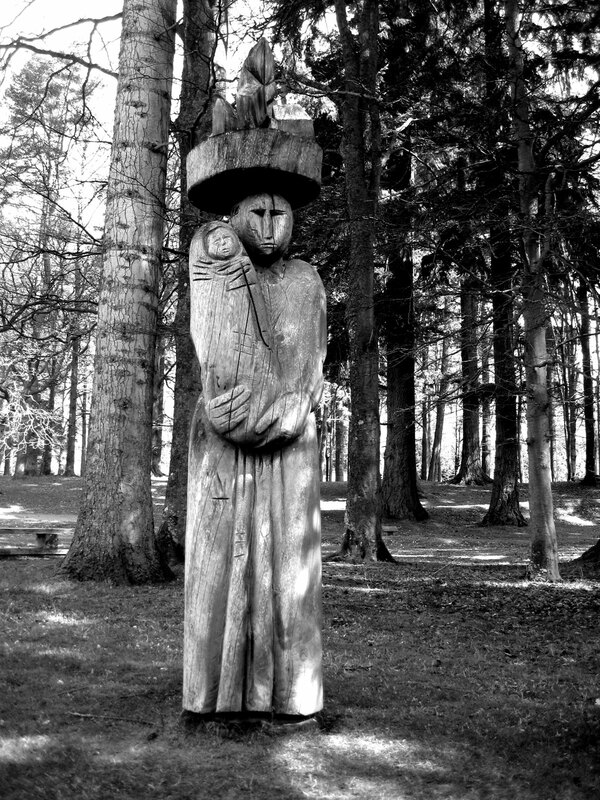 In unison with the badger-laden woods that surround it, the sculpture changes through the seasons. I’ve seen it gently deteriorate over the years, blending in with its surroundings. And this is what I think all sculptures should be like. Outdoor sculptures are the antithesis of the museum or gallery piece, kept away from us should we accidentally breath on it. You can get right up close to outdoor sculptures – even touch them! No stuck-up tour guide telling you ‘NO!’ here. Sculptures should be touched. They should be stroked, smoothed, squeezed and sat upon. Children should climb on them and play games around them. They should not only blend into their surroundings they should add to them – making you see a landscape in a new way or giving another dimension to your walk. You shouldn’t need an art degree to be able to enjoy a sculpture but this doesn’t mean it should be unchallenging. The sculpture park next to Lake Vyrnwy in Powys, Wales provides a perfect example. It’s in a stunning setting next to the Victorian-era dam and is packed with wonderfully weird, wooden sculptures from figurative to conceptual to purely abstract. My favourite piece is ‘Mother Earth’ by Russian artist, Galina Peserevan. It depicts a forlorn woman with a small village balancing on her head holding a swaddled baby. You don’t need to know what this sculpture means; I’ve got some ideas as to its environmental message but you don’t need to get that to enjoy it. It’s just lovely to look at. It makes you feel sad and childlike when you look up into her mournful eyes. She makes you want to get close to her, to get a hug from her almost, or to console her. And she looks so peaceful in amongst the impossibly tall trees around her – slowly becoming an indelible part of the wood where she stands. There was no-one telling me not to touch, no price label and definitely no red rope barrier and I know where I would rather be any day.